A telltale facial expression and anxious elevator behavior — both jumped out as odd signs to body language expert Dr. Jack Brown that something was not right with Stephen Paddock. "There's not any one thing that says 'this guy's a killer,' or 'whoops, this is an absolute call the police right now kind of behavior,'" said Dr. Brown. "But there are definitely anxiety tells and abnormal behavior to the point where it depends on your screening level." Meaning how much attention was being paid by those watching Paddock's movements at Mandalay Bay, if anyone was watching the high roller as he came and went over days, gambling all night long and carting in load after load of luggage. "He seemed like he really went out of his way to make it look casual," said Dr. Brown. "Take up the luggage not all at once - multiple trips - he really planned it out." So calculated, Brown said it was spooky. And a spooky demeanor is part of what he sees in one of Paddock's facial expressions. "That center forehead going up, a little bit of a mouth smile, that's a person with low empathy and low sincerity and that's also got a very high correlation with sociopathic behavior." It's an expression we all make once in a while, but Brown said those who do it a lot raise red flags. He blogs about the expression on the faces of convicted serial killers and foreign leaders like Russian President Vladimir Putin. Dr. Brown also noticed Paddock's elevator behavior. "He's got his legs crossed and his center of gravity is way off," he said. He said that might not seem abnormal in the moment, but in hindsight it shows significant anxiety. 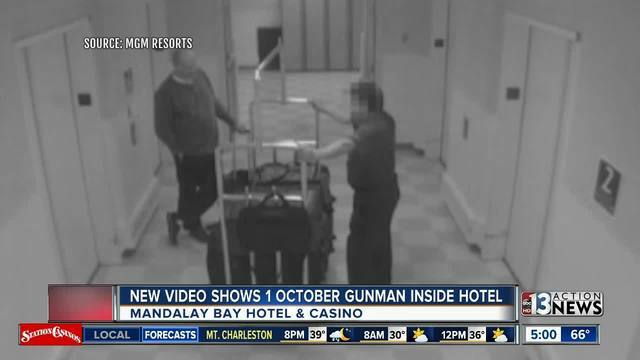 In another video clip, Paddock's "got his hands in his pockets and he's doing this (rocking back and forth) at the elevator. That's significant for anxiety." And while the behavior itself isn't necessarily incriminating, Dr. Brown said it's all about the context. "And that's particularly - the elevator thing was extremely out of context," he explained. Once inside the elevator, he noted how - multiple times - Paddock backs into the corner even though he's alone. "And the corner he chose was the corner with the camera, such that the camera showed the top of his head and not his face," Dr. Brown said. "Even if there wasn't a camera, that's odd behavior. That might be something, if I was screening for potential nefarious behavior, that I would look for." In the interest of providing greater context around Stephen Paddock’s actions in the days leading up to October 1, MGM Resorts has released these security videos and images. As the security footage demonstrates, Stephen Paddock gave no indication of what he planned to do and his interactions with staff and overall behavior were all normal. MGM and Mandalay Bay could not reasonably foresee that a long-time guest with no known history of threats or violence and behaving in a manner that appeared outwardly normal, would carry out such an inexplicably evil, violent and deadly act. Our focus continues to be on supporting victims and their families, our guests and employees, and cooperating with law enforcement with their ongoing investigation.